NOTE: Sorry to have lied in the title 🙂 I can’t add a single card, I need two to fill the sheet. I’ll aim to do another soon and add the pair in one PDF. ALSO, I had a few comments where people asked What I need is idea of what to do with my prints! 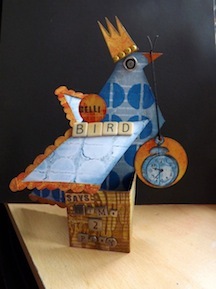 I do have a few projects that I hope are a bit interesting in the Gelli Plate Play menu item at the top. 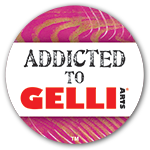 Hover over it and select Gelli Projects when the menu drops down. Hopefully some of those might inspire you. I am hoping this will explain a bit better the post from yesterday. 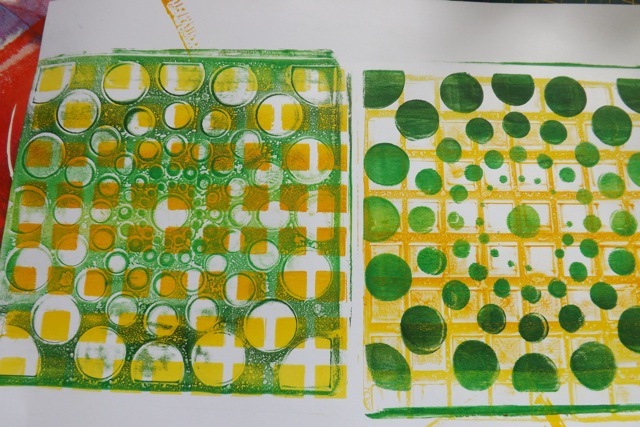 Here’s the deal: If you apply dots of paint to the top of the PLATE, then try to brayer over them, even if you do so in as straight a line as possible, unless you have a MASSIVE brayer, certainly for the larger plates, to avoid mixing up the colours yo either have to roll out the width of the brayer, then apply more dots of the same size, onto the open area, and hope the spread is such that you don’t lose the defined bands of colour OR you have to clean off your brayer first so you don’t cross-contaminate. If your cover is patchy, you have to deal with that as well. 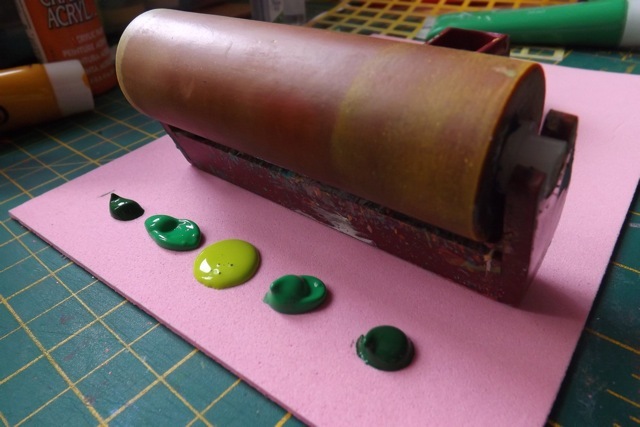 What I found, even with the 6 x 6 plate, is that it is far easier, and gives a better result to add the paint to a piece of Fun Foam to spread it and load the brayer, and then brayer the paint on to the plate. 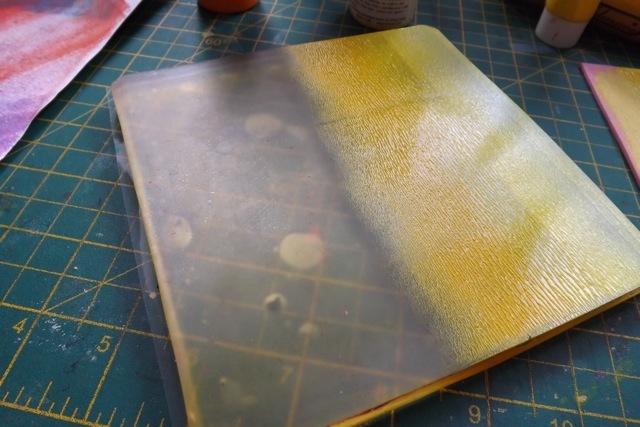 The nice thing is that the paint stays wet on the foam – I got at least 4 reasonable loads of the Gelli plate from one foam piece. And I can wash the foam and reuse it again. then brayer the other side. Depending on how you arrange your bands of colour you could get dark in to light then back out to dark again, OR two side-by-side groupings of the same colour strip. I neglected to put a sheet of paper under the plate which would have made the colour arrangement a lot more obvious. 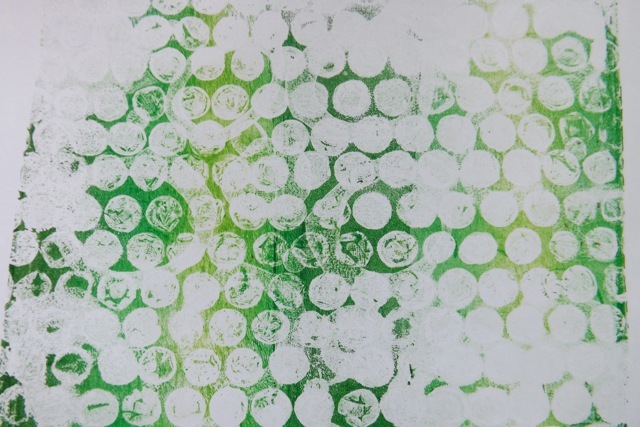 And even though the coverage on the plate may look a little patchy, see the print below – it looks fine. When you first try to roll out the paint on the Fun Foam, it will sqidge a little. Be gentle, don’t press too hard, and stay in a straight line! 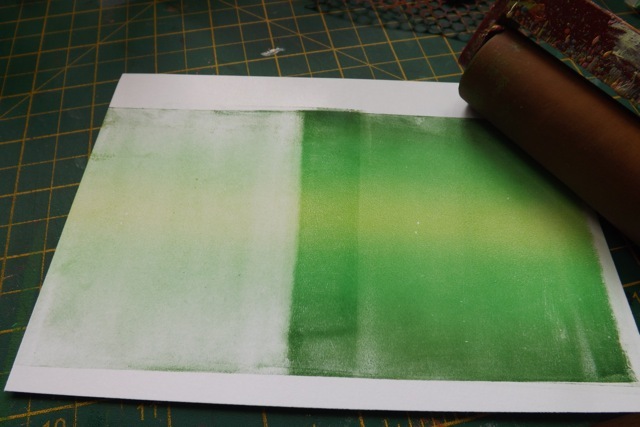 I also played with rolling the ombre strip in the middle, then rolling just on the edges – you just have to make sure only the edge of the brayer is on the plate. Look how cool the print is! And the ghost/2nd pull looks good too. 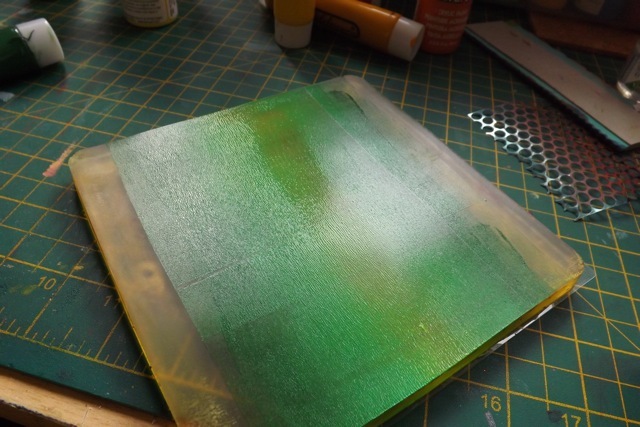 For these I just did the 1st pull then the 2nd, then the second layer for each was the reverse – I used a really simple combo so it should be obvious. 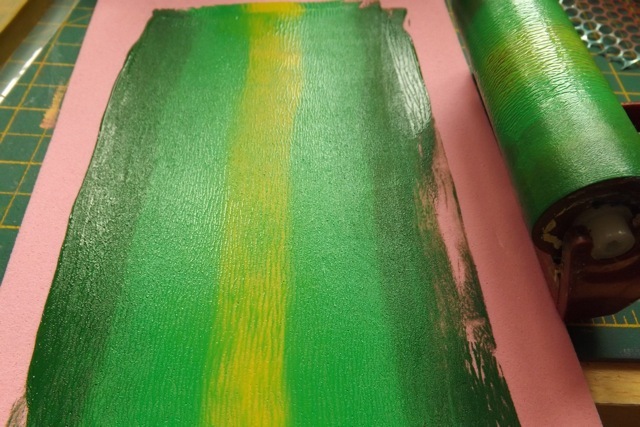 Left is 1st pull of yellow, with 2nd pull of green over the top. Right is 2nd pull of yellow, with 1st of green over the top. But there is actually a lot more you can do! I am interested in experimenting with unrelated colours, just to see how that works. 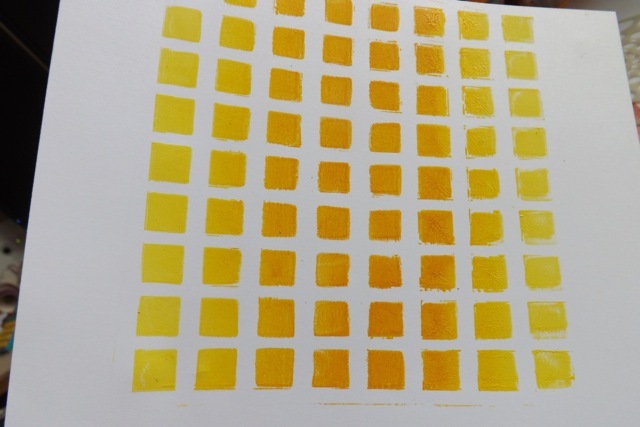 Yellow, Pink, Orange and Turquoise might be interesting…. Ideally I would be adding the card here, but as they are set up to be two per sheet, I’ll have to come up with another one first. 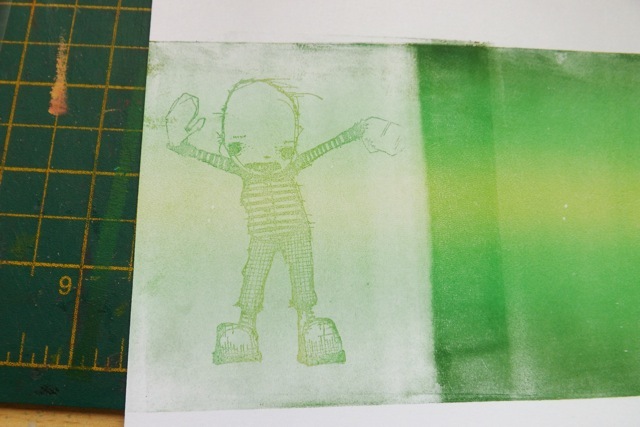 I’ve added a Gelli Recipe Card page under the Gelli Plate Play menu at the top. That is where I’ll be “collecting” them for now and where you will find this one when I get a companion one finished! 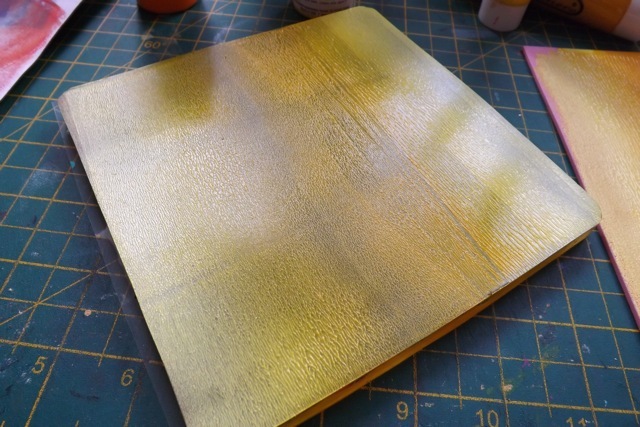 Categories: art, Gelli plate monoprints, Gelli Recipe Cards, tutorial | Tags: art techniques, Gelli plate, Gelli Recipe Cards, how-to | Permalink.